Yeshivat Torah in Zion head explains purpose of fund - raising the next generation of Torah scholars in religious Zionism. Torah BeTzion Dean and Echad l'Echad Foundation Chairman Rabbi Yitzhak Neria spoke with Arutz Sheva recently about the foundation's origins. "Six years ago, we sat and thought about what else can be done to increase Torah learning in our community, and we spoke about the need to raise up Torah giants," says Rabbi Neria. In the interview, which was done today during a meeting of about 100 yeshiva students supported by the foundation, Rabbi Neria explains the fund's goal: "This is the first time that nearly 100 yeshiva students from religious Zionism have been carefully chosen by their yeshiva heads. They are, with G-d's help, the future spiritual leadership. They are marked as capable of growing into the next generation of religious Zionism's Torah greats, and the Echad l'Echad Foundation supports them every month." The support given by the national religious public to the fund enables advancement of outstanding students and paves their way in difficult years. "The fund has taken upon itself to represent the public and to help religious Zionism raise the next generation's greats. Here are the best of the best that their yeshiva heads believe in and it seems this is really a team we can all be proud of. "Today, it's much harder to be a Torah scholar - coping with the economic situation, the social difficulties, they did the army for the most part, graduated matriculation with honors. Their parents and sometimes their wives cope with pressure for him to go to medical school or 'go to do something with themselves', and he chose to study Torah in order to be a Torah scholar. 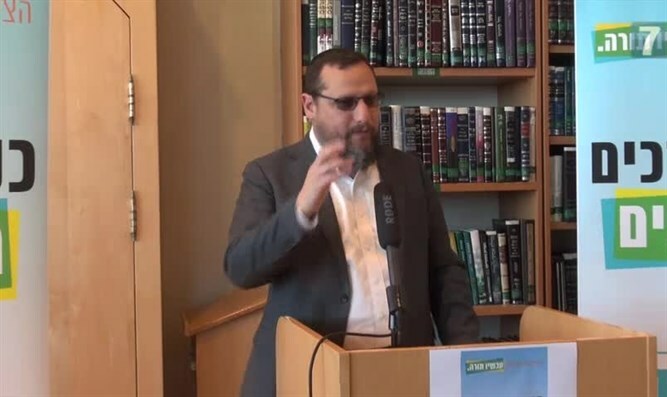 We owe it to ourselves to encourage them to continue to study diligently," says Rabbi Neria. The conference was attended by Chief Rabbi of Israel Rabbi David Lau and other rabbis who welcomed the scholars. Rabbi Neria sees this point in time as an important milestone in the history of religious Zionism: "We're starting a new chapter in the history of religious Zionism. There is a wonderful generation, great scholars. We're building the second floor out of which we look 50 years forward; this generation is the generation that will lead religious Zionism; Torah sages are the leaders of religious Zionism. Whether or not people are aware of it. We rely on Torah scholars from previous years, but we have to worry about the future, and that's what the Echad l'Echad Foundation does." Rabbi Yitzhak Neria explains how students are chosen: "Those who are here are yeshiva students from all religious Zionist yeshivas: Har Etzion, Har HaMor, Yeruham, Mitzpeh Yericho, Mitzpeh Ramon, Dimona, Beit El, Yeshivot Hesder, Advanced Yeshivot, kollelim; all of them, truly all of them. We didn't mark them, we didn't sort them out, or choose them. We asked each yeshiva head to choose the best that he thinks he can represent and develop in his studies and continue on to be one of the greatest of the next generation. We have to go up a level to build a high-grade of scholars."